Walking in the weeds . . .
. . . . and now waddling away! This entry was posted on 21 April 2009 by mon@rch. 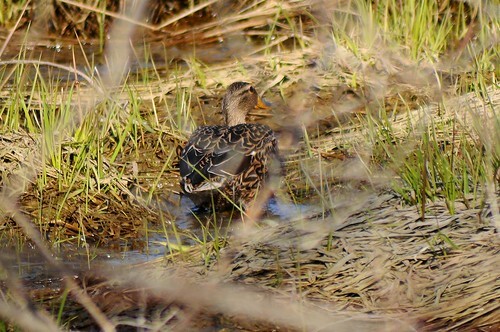 It was filed under Birds, Flickr, Nature, photography and was tagged with Mallard, Wordless Wednesday. That first picture especially shows what a great camouflage she has (and what a great eye you have)! I spy with my little eye something looking back at me! It’s amazing how easy it is to almost miss something right in front of you! I think that duck has been hanging around with the snipe. 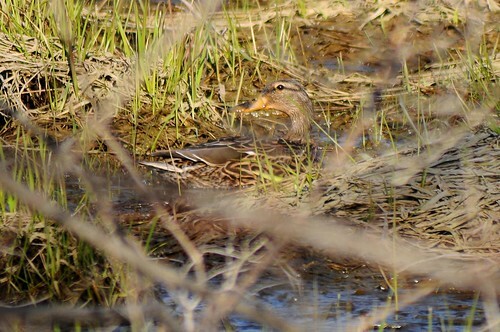 You have a good eye to see the snipe who has a pretty good camouflage. Nice photo.